Heading west on Interstate 40 through Oklahoma and Texas, my mind is leaving the Central Plains behind. I’m going home. Home to the state where I was born and raised. Where I first experienced railroading up close. Where I barely scratched the surface of rail photography. Day 5 on the road: We’re at the end of I-40. Then we’re at the junction of I-15 and Highway 58. We peel off on Highway 58 as our destination the following day would be our temporary quarters in the Sierra Nevada. Reality is settling in. One day left in summer, and the late afternoon sun is baking the Tehachapi landscape as I quickly point out the loop to my family. I would be here soon. The words “green” and “Tehachapi” don’t go together. The matching word is “trains,” and I’ve been waiting forever to get back. I’m as anxious to show him around as I am to relive those precious few train watching days of old. Up the hill to my old hangout at Woodford. We find a BNSF westbound grain train sitting in the siding. At the east switch, the DPUs are in perfect position for a side-by-side shot with an eastbound. Finally, after close to 70 minutes, we see a UP “hotshot” coming around the curve at a snail’s pace. The wings of the Union Pacific and the “Swoosh” of the BNSF mark the two stars of the Tehachapi show. At the east switch of Woodford, a hot UP eastbound passes two BNSF DPUs on the backside of a westbound grain train waiting to go down the hill. We hop in the car and head for the loop overlook. We’re fairly confident that a brisk walk to the spot we want will be just in time as he curls around the hill. A green landscape sets the scene as UP 5406 East curls around Tehachapi Loop on February 25, 2016. The train crosses over itself with stacks emerging from the loop tunnel (No. 9) as the head-end power pulls toward Tunnel 10. We see that the westbound grain train has vacated Woodford. We decide to take a peek at Tunnel 2. 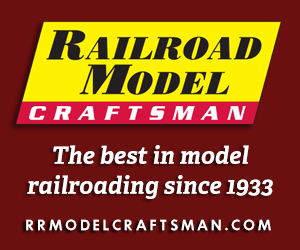 The wait is much too long, so we figure that he slipped into the Bealville siding. Is there a hot westbound on his heels, or is there something coming up? Our answer comes a few minutes later as we hear a horn down at Caliente. From a picture perspective, I’m not terribly sold on an eastbound here. I confess it turned out better than I thought with the backdrop of green hills pulled in by the longer lens. 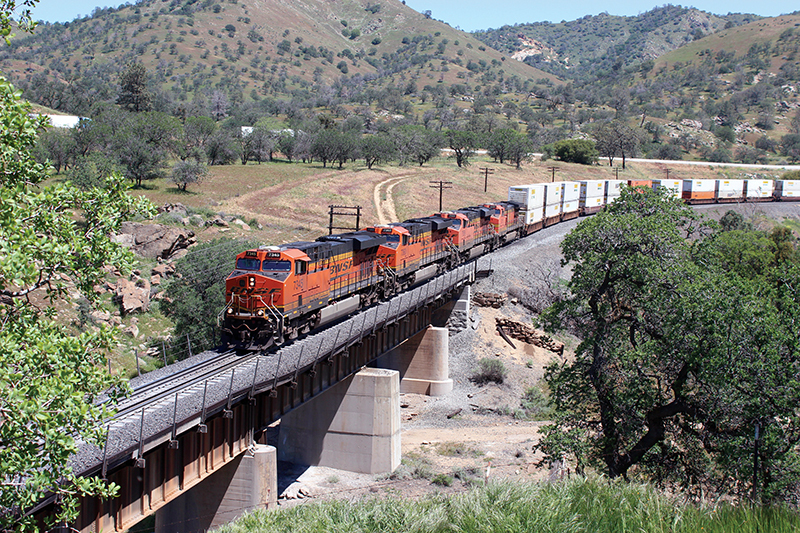 A small slice of Centennial Ridge provides the backdrop for this BNSF train climbing eastbound above Caliente on February 25, 2016. The hotshot, led by ES44C4 7085, is about to enter Tunnel 2 and will hit the west switch of the 13,270-foot Bealville siding around the corner from the portal. We’re situated at Woodford again, and my mind drifts back to 1982. For those of us who didn’t have scanners back in the day, you could certainly hear eastbounds working upgrade as EMDs and GEs were pulling for all they were worth, and you could see westbounds coming down from the loop. That gave enough time to set up for a photo. 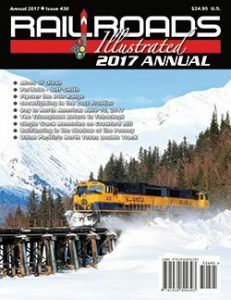 The last train of my spring 1982 outing had an interesting helper — SP SD40E 7342 — the “Daylight” unit (see Railroads Illustrated October 2012). Down the hill to the Bealville crossing for another shot and a good recording of those SP horns. 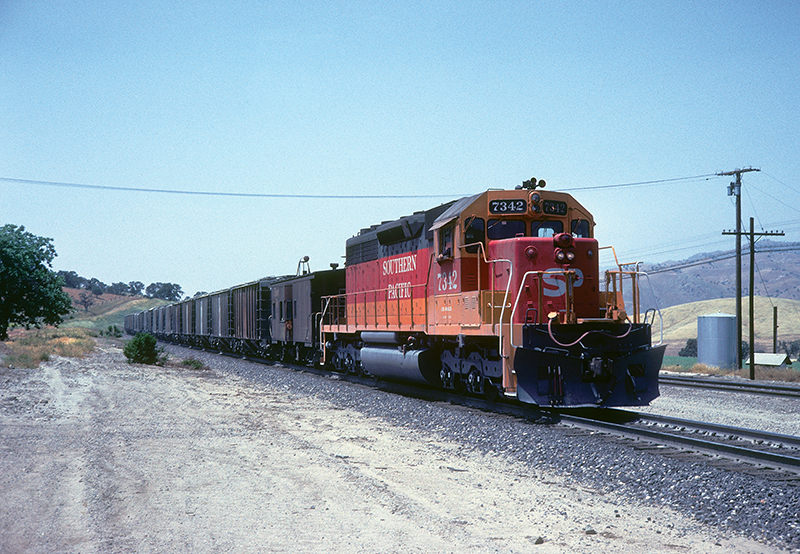 ABOVE: A westbound Southern Pacific freights pulls by the road crossing at Bealville in spring 1982. Six units are on the head end with SD45T-2 9339 in command. 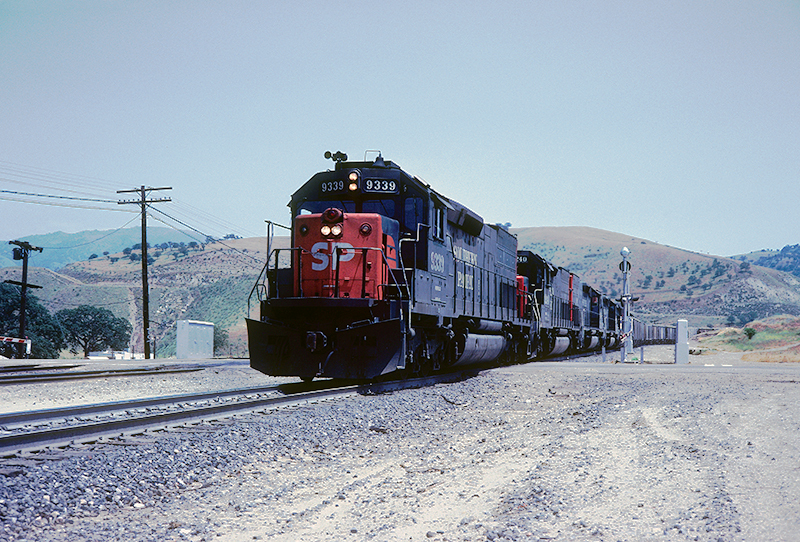 BELOW: Helping with the dynamic braking on the rear is SP “Daylight” SD40E 7342. “I’ve got some more business in Bakersfield on the backside of the day you want, so this might work out,” Don says. We’re planning another Tehachapi run mid-April — this time a Saturday outing. 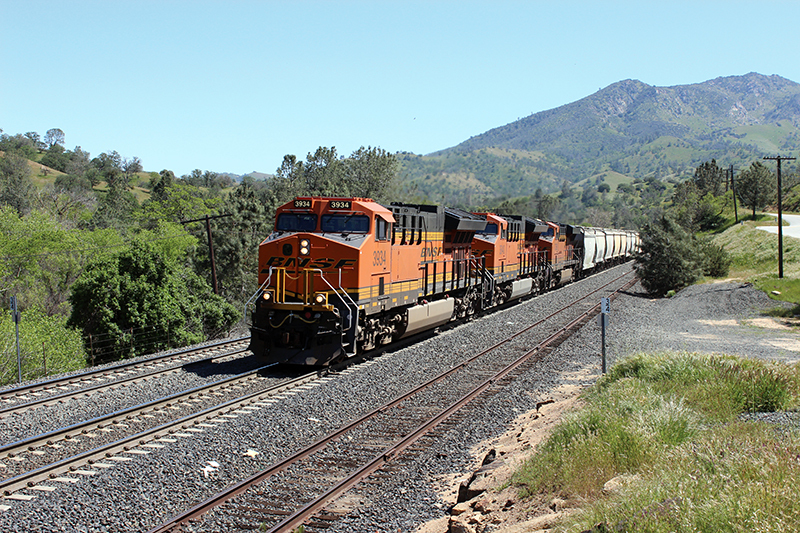 It’s a westbound BNSF stack train that meets an eastbound BNSF stack at Caliente. The eastbound has a green through Bealville, so after watching him clear the crossing, it’s off to Woodford. 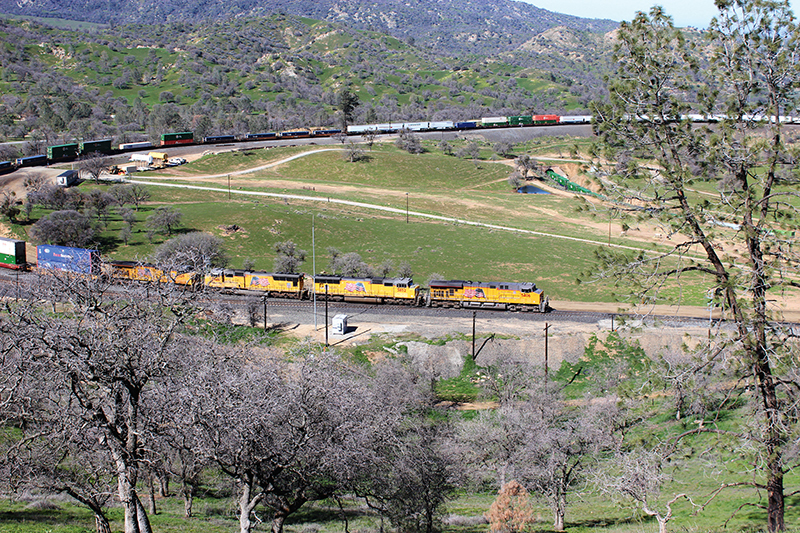 The dispatcher has him running in the siding, so we spring over to the Tehachapi Creek bridge for whatever comes west. 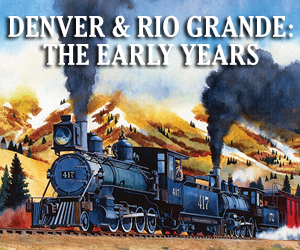 It turns out to be a BNSF hotshot — shades of the old Santa Fe 199. 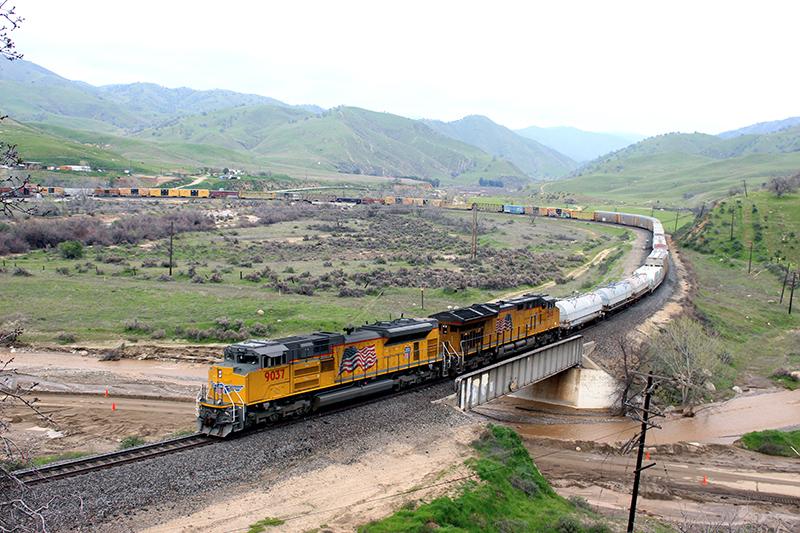 A Chicago (Willow Springs)-Richmond Z train comes across the Tehachapi Creek bridge at the east end of Woodford on April 16, 2016. 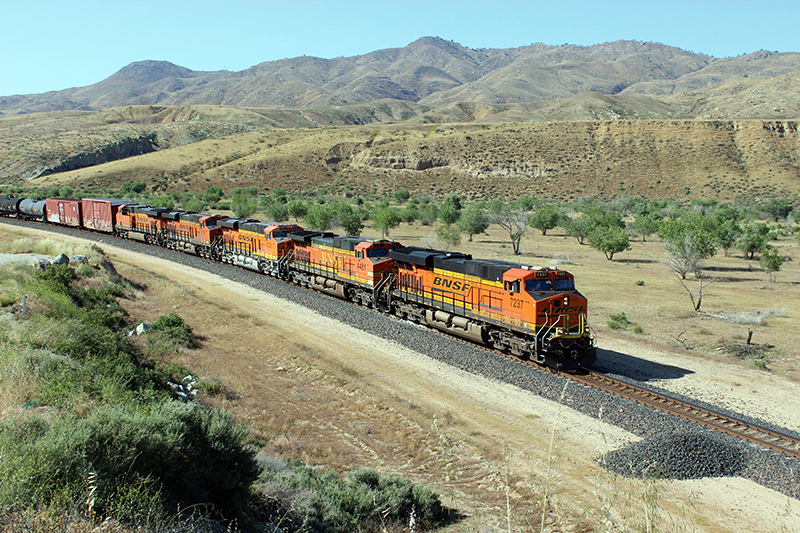 While UP dispatches the Tehachapi Line, there will be no interference for BNSF’s hottest train — it’s all green to Bakersfield. Leading the motive power quartet is ES44DC 7345 with J.B. Hunt stacks and a long line of LTL and UPS trailers following. While we may have missed one westward train during lunch, we finish up in downtown Tehachapi and head back to Woodford. We’re aware of at least three trains moving west. We get situated again and ready ourselves for pictures. 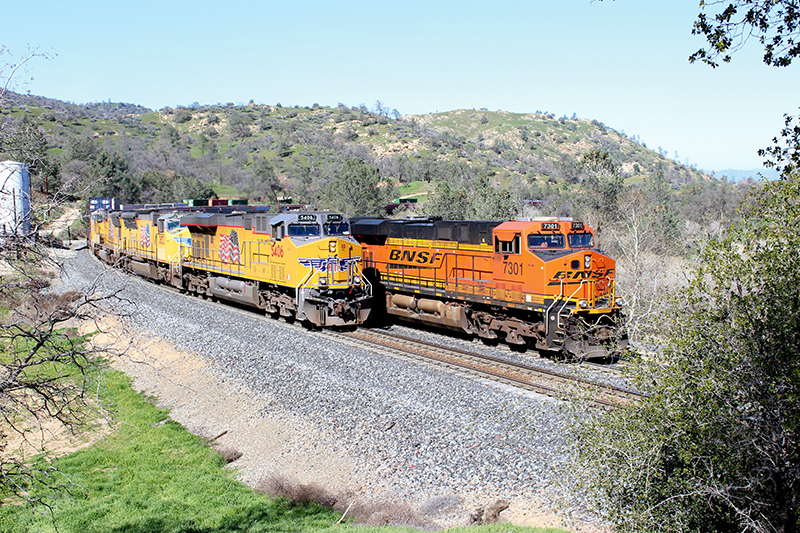 The first two are BNSF freights running fairly close together, the second having a pair of Tier 4 ET44C4s up front. In California where air pollution is a problem for two-thirds of the state, Tier 4 locomotives are becoming more common. This BNSF westbound has two Tier 4s leading, ET44C4s 3934 and 3840, plus a trailing unit and one DPU attached to the rear. The surrounding landscape is still green on this April 2016 day. The third westbound is a UP, and we chase him downhill to Bealville, but the sun is in the perfect spot for the shot we didn’t get last time — between Ilmon and Bena. We arrive, set up, and wait. After some time, we detect the sound of GE locomotives closing in on us fast. 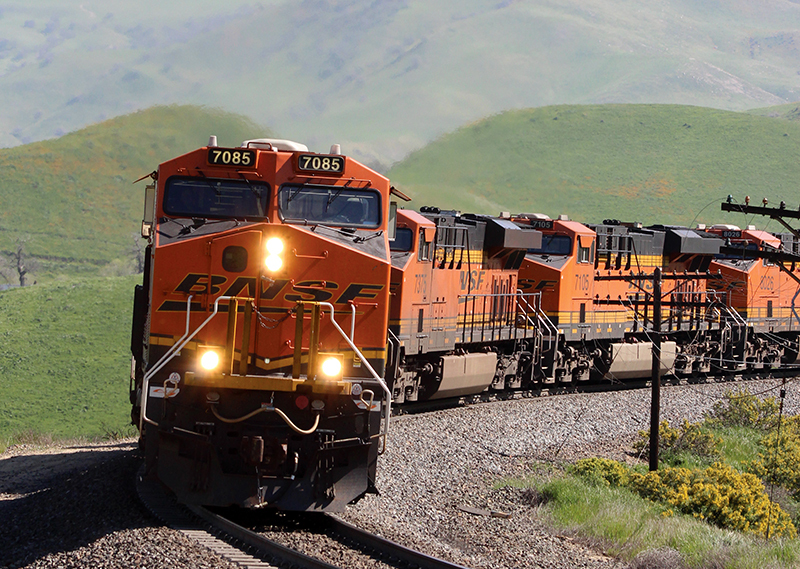 An unexpected BNSF eastbound is cranking along with five units, making for an excellent image. The hills around Bena and Ilmon are beginning to fade to the usual brown as a BNSF freight zips eastward on April 16, 2016. Five units power the train with ES44DC 7237 on the point. In a minute or so, the BNSF will see the headlights of a UP westbound stopped at Ilmon, the west end of the short double-track segment extending to Caliente. Albert Hammond and Mike Hazlewood had no idea in 1972 how true those lyrics would ring in 2017. Our California cup has runneth over — like way over! As we contemplate another “Tehach” session, water has wreaked havoc on rail lines around the state. Arriving in the afternoon and securing our hotel room, we venture to Caliente. It’s not a pretty sight. Bealville Road has transformed into a raging river flowing under the rail bridge. Before the curtain falls, we document the rare sight of Caliente’s “water hazard.” That ends the adventure for now, but we know we’ll be back again. This image is less about the train and more about scene. In fact, it does rain in Southern California, and the Bealville-Caliente Road is a river on February 25, 2017. Workers have scraped a small path wide enough for one vehicle to get through. A UP train is winding around Caliente westbound as two DPUs bring up the rear.